With that, I am happy Amy agreed to an interview. It was so much fun for me to research and develop questions for her. I think her answers will not only make you smile, but inspire you, to be even more creative, as they did me. Tell us how you began quilting? Were there other quilters/sewers in your family? I love those photos on your blog of you when you were sewing with your Great Grandma, and the one of you in the front of the 4H banner. Hi Anne! First off, thanks so much for having me! What a treat to be featured! I learned to sew when I was 6 or 7 years old in 4-H. My mother and grandmother were both 4-H club leaders, and great sewers, so I learned from them, starting with a gathered skirt and moving on to other garments and home dec projects. When I was 12 years old, I decided to take the “Patchwork Arts” unit in 4-H, and joined a local charity quilting group to help me learn the ropes. That was so life-changing! It was a humble little group, that met in the basement of a tiny little rural church, but was thoroughly equipped with everything a quilter could need. 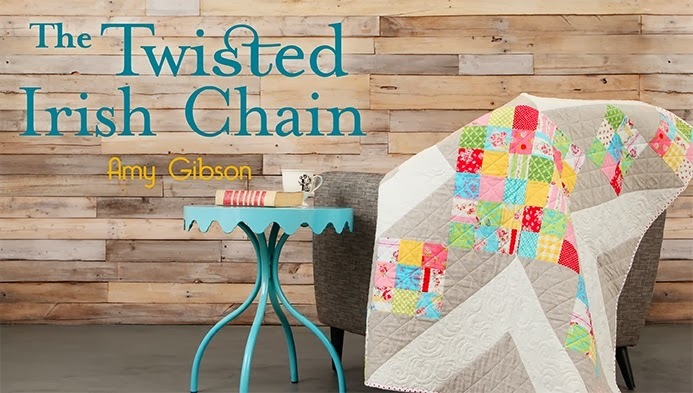 It was from those sweet ladies that I learned about rotary cutters and strip piecing, how to baste, and how to tie a “quilter’s knot”…so many little tips and tricks. Watching my first quilt come together was such a thrill! Wish I could have kept it, but I also felt great to give it to charity. I was born and raised in Denver, Colorado! I went away for a short spell, to get a college degree in central Virginia (and a husband! ), but I couldn’t stay away for long – we moved back to the Mile High City right after our wedding, and are thoroughly enjoying raising our 4 children here. It’s really a blessing to be raising my family in the same area that I grew up…taking them to all the fun spots and events that I enjoyed as a child…it’s really cool. How did you come up with the name “Stitchery Dickory Dock” for your blog/business? And why did you start a blog? I started my quilting business in 2008, and actually started off as a small Etsy shop selling quilts, retro-inspired aprons, and other little patchwork items. It really was a great fit, because clocks (like in the Hickory Dickory Dock nursery rhyme) have a really strong place in my family heritage. My grandfather was an engineer who spent a lifetime restoring beautiful clocks- his home was filled with them. And my grandmother, on the other side of the family, had an old German cuckoo clock in her kitchen for as long as I can remember – brought to America by my great grandparents. I love the monthly personal challenge posts on your blog. It’s so original and authentic. How did that idea come about? I can’t tell you what joy it brings me to hear how folks are excited and moved by the personal challenge portion of this month’s Sugar Block Club. So much, partially because I felt it was a risky direction to take. Folks would either love it, and join me, full hearted, or they’d hate it, and be annoyed that we were straying so far from quilting. In the end, my heart won and I went with it. I suppose I craved an excuse to write about something deeper than wonky stars and paper piecing technique. Yes, I will always be hopelessly in love with quilting, but what really moves my heart is the relationships and growth that I see in the online quilting movement. People coming together, supporting one another, making things with meaning and love and passion, overcoming self doubt and learning to be fearless. To me, this is such a big part of quilting – personal growth – so it felt so natural to pair it with the community I have come to love so much. Tell us about the Sugar Block Club? How it begin, and how is it evolving? Were there really 1000 quilters from all over the world and now 100,000? How did that happen? Well, the Sugar Block Club really came into being as the 2012 Craftsy Block of the Month was nearing an end. That year was AMAZING – so many quilters coming together, making the same blocks but with their own unique twist – and it boggled my mind at how diverse the group was. About 175,000 quilters came together over that sampler, modern to traditional to art quilters – everyone found a place – and I just couldn’t bare to see that momentum and enthusiasm end. We were having way, way too much fun to stop! So I decided I’d continue it by creating a monthly BOM subscription that was full of all the things I loved – classically inspired blocks, yummy recipes, pretty fabric, and now the even deeper challenge of looking inward and doing a little piecing of the heart. As it continues to grow, I am so grateful and inspired by all those who have decided to join in. How did you become a Craftsy instructor, and tell us more about this experience? Oh, what a joy to work with Craftsy! What an enormous blessing to have the opportunity to be part of that wonderful family. 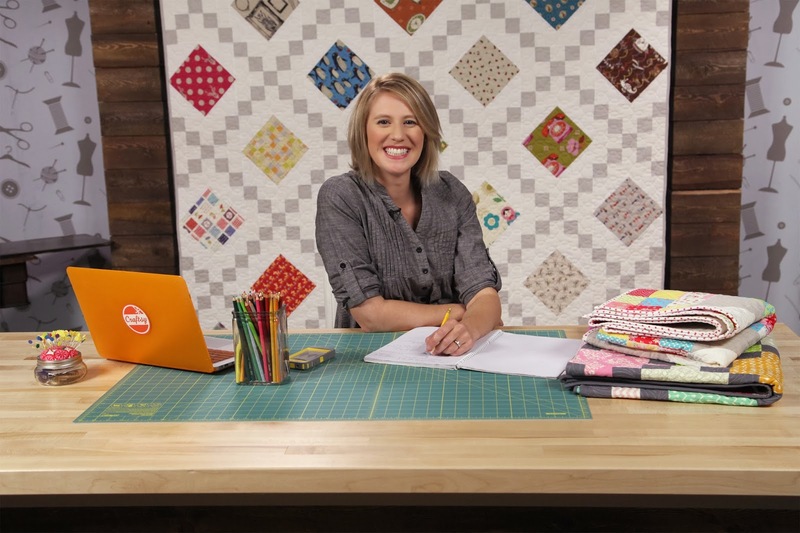 They came onto my radar back in 2010 or 11 I think, when Jenny Doan of The Missouri Star Quilt Company released a class for them called “Quilting Quickly.” I actually won enrollment in the class in a giveaway (crazy, right?! ), and I was just delighted by the unique advantages that their online class platform had to offer. How did you learn to create and write your own patterns? What would you recommend to those who want to learn how to design fabric and patterns? As far as quilt design goes, for me it was pure trial and error…and a whole lot of math. A ton of math. And boy did I hate math in school, but now that I use it every day to make quilts that I love, I actually kind of enjoy all the number crunching. It can be a brain bender at times, but once you get a strong grip on the basic formulas for calculating patch sizes and fabric requirements, it’s liberating. As far as inspiration goes, the sky is the limit for me – I’m constantly taking photos on my phone of tiled floors and woven rugs…pretty garments or architecture that contain an element I love, and think I could incorporate into a quilt. I’d also advise anyone interested in designing their own quilts to pick up a sketch pad – I love the White Lines graph paper pads – and some colored pencils. Sketching is a really helpful step because when you have a cool idea in your head, it’s important to put it on paper right away. No need for the sketch to be perfect or even the right colors, scale, etc. For me, it’s just getting it from my head to the paper. After that, I usually take my sketch and create the design in a quilt design software program. I use EQ7 by the Electric Quilt Company. The software allows me to tweak things and play with the design and fabrics, without having to re-sketch it every time. Definitely a major time saver, and admittedly, a whole lot of fun! How would you describe your design style? Traditional, modern, other? You know, I don’t know quite where I fit in. I wouldn’t say I’m modern because I love the classic vintage piecing, but then again I’m not entirely traditional because I love bright, poppy colors and modern prints. Tell us what inspires you? Oh my, so much! Rich colors, meaningful stories, nature, history, family… Everything and anything. Favorite part is probably design and piecing. Least favorite…mmmm, probably cutting. Especially on larger quilts, it can get sorta tedious. I’ve definitely suffered sore arms the day after cutting patches for a great big quilt! You have a large family and a thriving business. How do you juggle it all? Sshhhh…the secret to my madness is a messy house and totally unorganized schedule! Seriously though, I wish I had some amazing tips to share. The reality is, I don’t quite know how it works. Sometimes it works because I spend all day in pajamas and let the kids enjoy movies & popcorn in bed. And sometimes it works because I “get it together”, and actually do organized things like freeze-ahead meal planning and task lists. Oh goodness, this is a tough one. Designers? Collections? I’m a major sucker for modernized vintage reproductions – love sweet dainty flowers in poppy colors and funky little geometrics. And really any bright small scale blender prints are my friends, as well as great low volume neutral prints. Oh, and dots! Tiny pin dots- I can’t get enough of them. A Great Give-a-Way – Amy is offering two great give-a-ways for two lucky winners. All you need to do is leave a comment in my comment box below, telling us what online class you would like to see in the future. Please leave me your e-mail address as well, so we can contact the winners. This give-a-way ends on Saturday, February 15th at 12:01 AM, and the winner will be announced on Saturday morning. 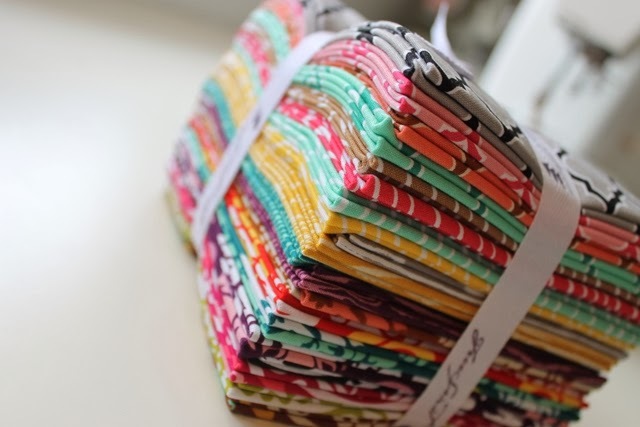 The first of these prizes is a free Quilty Class that Amy is teaching, called…. The second of these two prizes is a is a beautiful bundle of fabrics, True Colors by Joel Dewberry. Thank you so much Amy, for sharing your thoughts, your life, and quilting and sewing inspirations! !